This is my short story on my South African project with elephants. I must admit to being a little nervous because even though I have travelled before as a backpacker this was entirely different and it had been a long time since I had been abroad for a longer period of time. South Africa had always been a place I may like to visit and also I really felt like I wanted to make a difference to something no matter how small and I had wanted to see elephants since I was a little girl so this made sense to me. So along came April 3rd, 2016 my travel date and I did feel pretty nervous but excited too. When I finally arrived at George airport I was collected by Jay and Kathy volunteer co-ordinators and there were other volunteers already in the minibus that had just arrived. We then arrived at the elephant park and the surroundings were beautiful. I was shown my room which I was sharing with another new volunteer and it was better than I had imagined. Meeting the elephants we would be working with was just such a magical wonderful moment that I couldn’t even describe if I tried just unforgettable and I will admit that there were tears. Now for actual work, we had some training and health and safety talks etc. 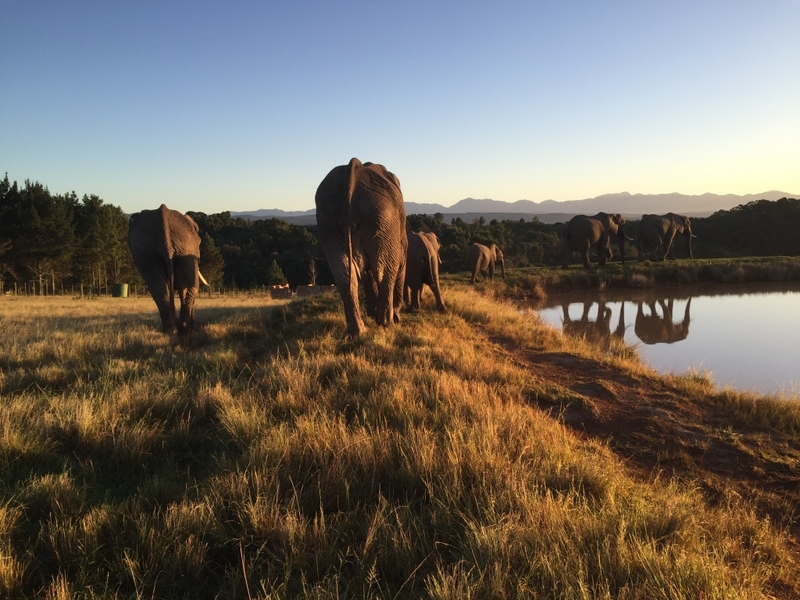 then we went down to the field to start our research with a herd of 7 elephants comprising of two boys, 4 girls and the matriarch Sally with one tusk. Armed with a clipboard and a stop watch my first job was to record each elephant’s behaviour every five minutes for example feeding branches, interacting with a tourist, feeding/grazing or walking. The hardest thing for me was identifying them correctly because we had been told that if we really weren’t sure which elephant it was we were recording then not to lie or guess as it could affect the results that go in to the database, more often than not though I was able to ask the guides for help as they were just so friendly, knowledgeable and happy to help me and it didn’t take long before I was able to identify each elephant correctly be it by the tusks, tail or even the ears. The other research in the field was to take one individual at a time and measure the distance between itself and each of the other elephants. As well as this we also spent a shift during the night doing Boma observations which is where they sleep, so one shift I may be inside recording what each elephant was doing again every 5 minutes for example was it sleeping standing, sleeping laying, feeding straw etc. or I may have a shift outside doing the same except it was quite difficult to identify some of the elephants then due to it being too dark. Apart from the above we were welcome to go down to the field in our time off to see the elephants which I did and quite often was able to get really close to them on the guides advice and was even fortunate to be able to kiss my favourite elephant on its trunk. I cannot tell you what a feeling of pure peace hits you it’s both emotional and so wonderful to know that the elephants are so happy and so well looked after as some of them do have a sad history but I felt it best to try not to think about that. On our weekends off we used to go to Plettenberg Bay to the beach and swim in the lagoon as sometimes the waves were way too mad to risk swimming to far out. Another time a group of us went swimming with the great white sharks which was a fantastic, amazing experience. The hardest part for me was when I had to leave and say goodbye to the guides, co-ordinators and of course the elephants as you really do form close bonds with them and you do feel a strong connection with them or in my case one particular elephant called Nandi whom I just adored. I still miss them now and would like to go back again and would go back tomorrow if I could. My South African project has however inspired me to enrol on an Elephant Care Behaviour and Welfare Diploma Level 3 and who knows what might transpire. Next Post Great news for travellers to Chile!